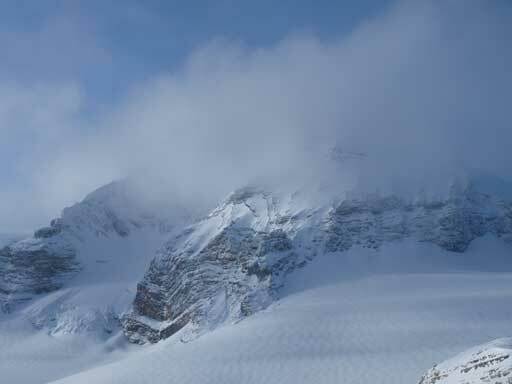 “Vulture Peak” is the unofficial name of the highpoint overlooking Vulture Glacier on the edge of Wapta Icefield. It’s sandwiched between Mt. 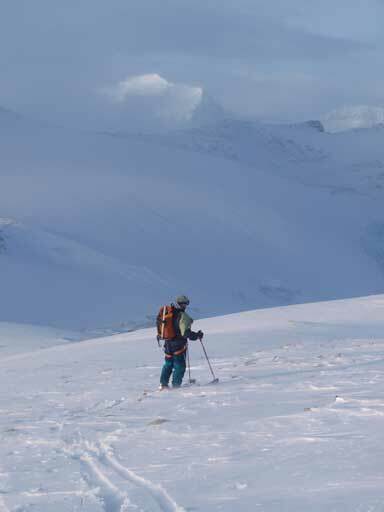 Olive and Crowfoot Mountain – both are classic ski-mountaineering objectives. Vulture Peak by comparison had received much less interest simply because it’s not nearly an aesthetic ascent. 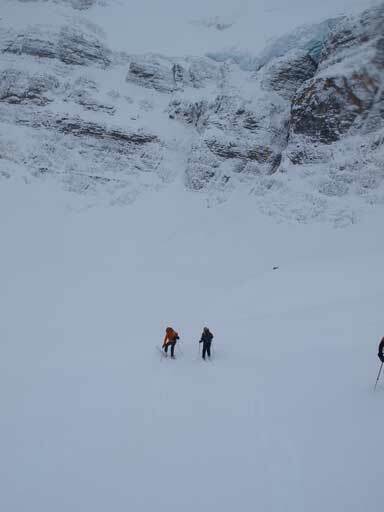 It also seems like the most logistic way to tag this summit is as a short side-trip from the classic Wapta Traverse. 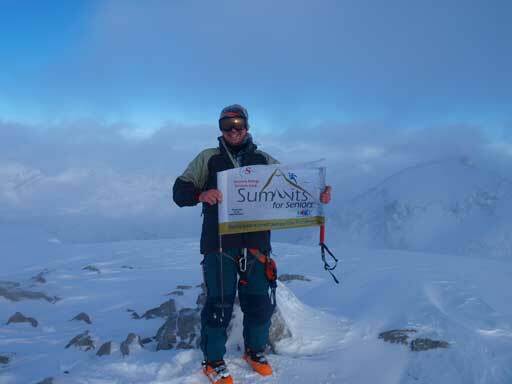 Kevin and I are peak-baggers so it didn’t really matter how we approach it, as long as we could successfully reach the summit. This was the second day of our “End of the world” Bow Hut ski trip (did The Onion on the first day). The 6 am alarm woke us up and looking through the windows revealed some bad news… Instead of “a mix of sun and clouds” as predicted by the weather forecast it was snowing. 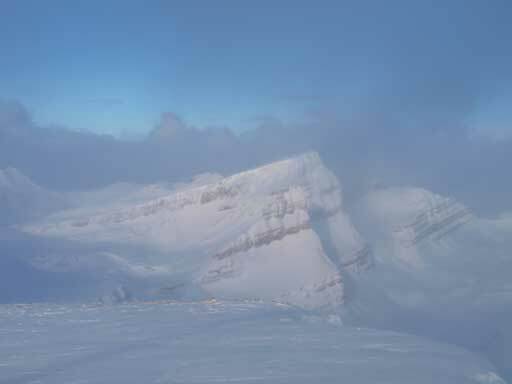 Maybe the world did end… However, we could see the outline of Crowfoot Mountain so the visibility wasn’t too bad. At this point I was still optimistic about our primary objective, Mt. Olive. And long story short, after breakfast, we left the Hut at 7:20 am. 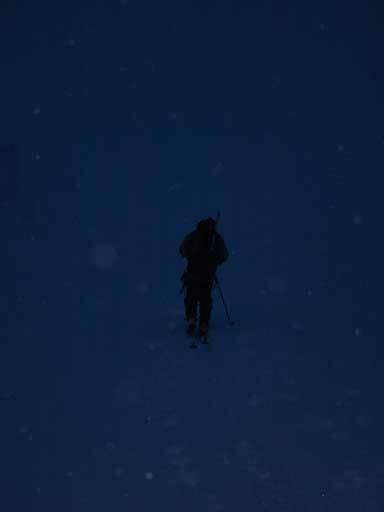 With headlamps on, we started marching up the headwall. 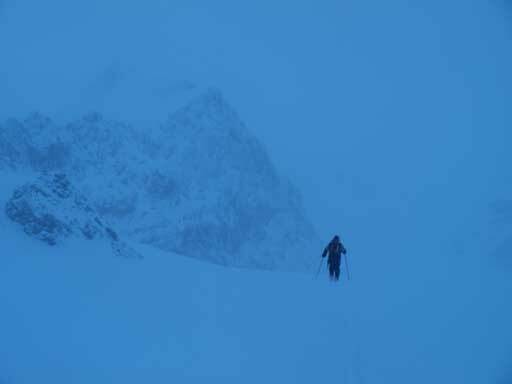 It was dark, snowy, but not windy. After what seemed like a long time, it started to get brighter, but there was no sign of improvement in the weather. Our confidence level got lower and lower, and eventually our group members started to bail out one by one, and eventually it was only Kevin and I marching up the glacier. 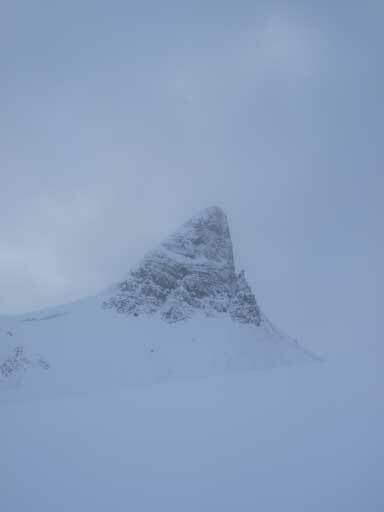 It wasn’t a total white-out and we could see St. Nicolas Peak so we kept going. 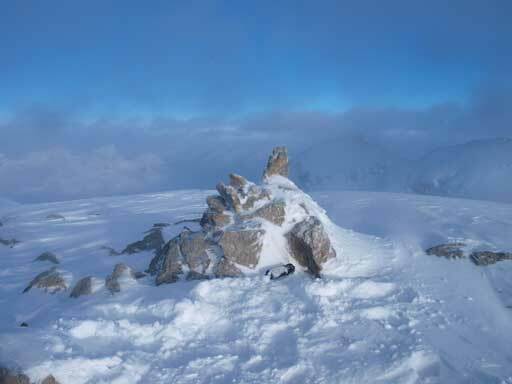 While contouring around St. Nick, the weather was slightly getting better and better, and we decided to ascend up St. Nick/Olive col and then evaluate the condition (we already downgraded the objective to Vulture Peak). The upper slope near the col wasn’t snow covered and we had to take off skis and carry them up, and that was really awkward.. Thankfully this wasn’t long. Looking up towards Olive, orange colours, then sunshine!! It was indeed getting better. Orange colours started to show up behind Mount Olive. Good sign! Nobody said anything and we kept moving on Vulture Glacier, and 2 min later, we finally could see Vulture Peak. It looked quite far away though. We went straight towards the peak over a small bump. This section was mainly down-hill and on since we were skiing, it took us no time to arrive at the base of the final slope. 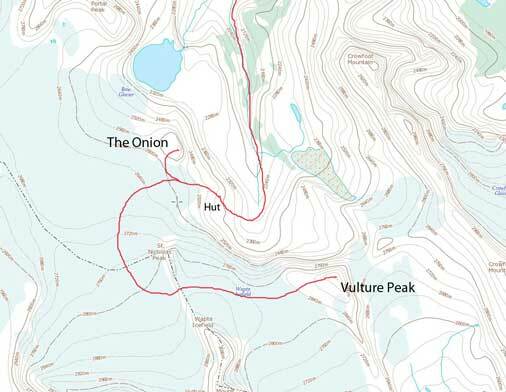 It’s a tedious plod, but we did manage to skin all the way to the summit, and meanwhile, some blue colour started to show up above us, and then Thompson, Olive, Balfour, Crowfoot, and eventually, Collie, Baker and Hector! Wow, given the weather we felt like stealing something! We didn’t bother to sign the frozen register. It was too cold! 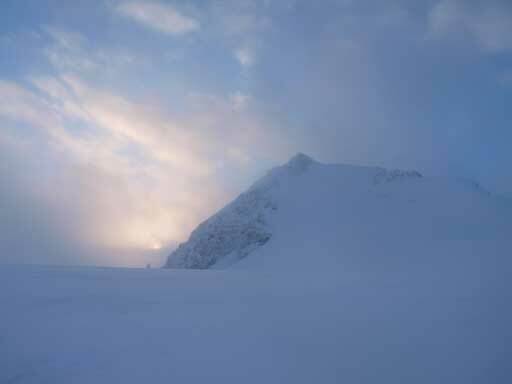 We got some brief sunshine on the summit. It was windy and cold, and we didn’t even bother to sign the register. After a few photos, we soon started down. We both had the concern that the weather would move in again. Slogging back up the St.Nick/Olive col was boring but at least didn’t take too long. We had a brief discussion whether attempting Mt. Olive or not. Again, given the unpredictable weather we voted for no, and we were right. 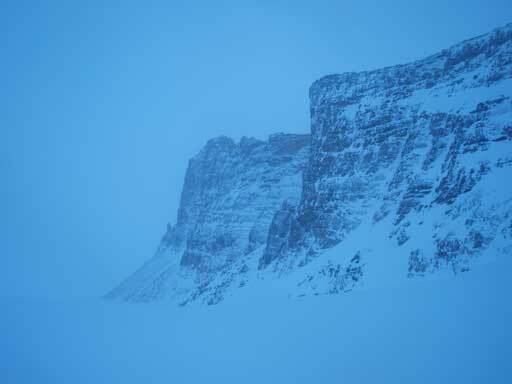 Once back at the col, the weather closed in again. We also couldn’t figure out where we went up as the tracks were covered, but we had to get down anyway, so we took off the skins, and picked a direct line down the col. The rest of the way down was so fast, 5 times faster than snowshoeing.. Too bad the slope down the headwall wasn’t all fresh powder (thanks to Vern, Kelly, Bill, and Wietse), and those ski tracks created some challenge to me. I did two face plants due to the unexpected “bumps”… Falling on soft snow wasn’t hurt anyway and it was pretty fun. 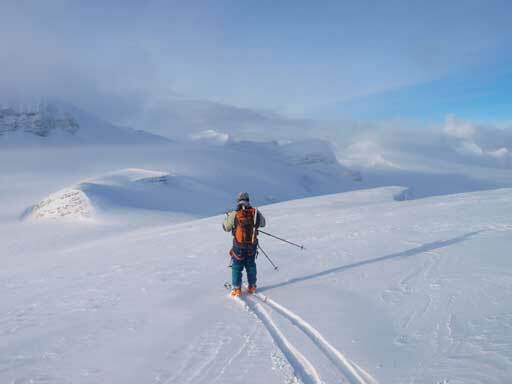 We still had a lot of time and after a long break we decided to ski out. The weather wasn’t getting any better and visibility was pretty poor. 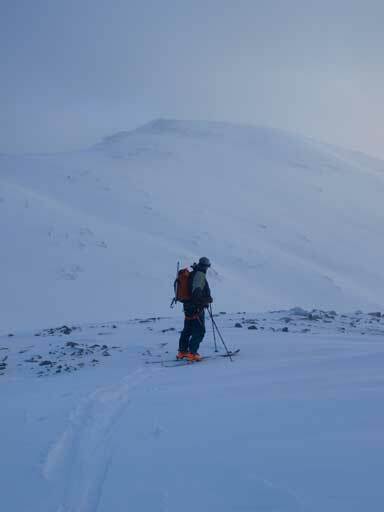 We also had no track to follow, and thus the ski out was quite challenging. 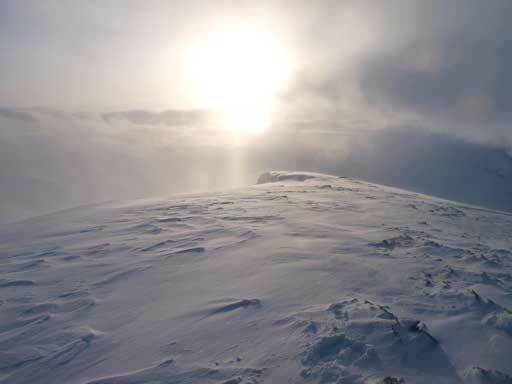 Lots of route-finding, uphills, side-sloping, avalanche slopes, unexpected rocks and boulder fields. I had no clue where this route goes and I was just following. We ended up too high and had to descend a steep gully. It was beyond my comfort level and after skiing in, I wasn’t brave enough to force a turn. Thank Bill again for teaching me kick-turn, and it worked out perfectly. And then more route-finding, we were back at the canyon, and the rest of the way out was a pure slog, as nobody was using wax. The drive back home wasn’t fun at all compared to the awesome trip we just had. The temperature kept dropping and it was -21 after exiting the mountains, and it started to snow too. The forecast for the following few days was pretty cold too, so I drove back home. Overall, awesome trip. 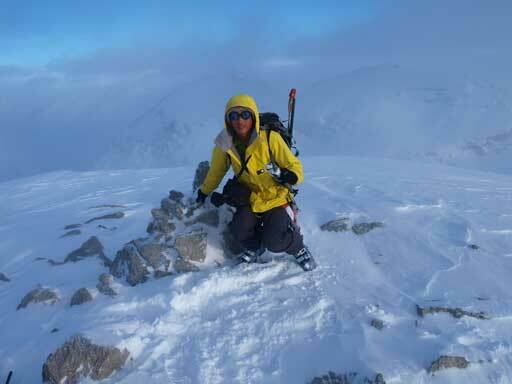 I’m looking forward to the next ski ascent.